The universe is communicative but also very subtle. It’s sending you a message constantly, if you know how to listen! Everything you see, hear and come across, is more often than not a response to what you are thinking, feeling and believing. Humming a particular song and you see related lyrics in an advertisement? That’s a naïve example to my point, but doesn’t that happen in more ways than one to all of us and almost every other day? Most times you wonder at the beauty of it and let it pass. 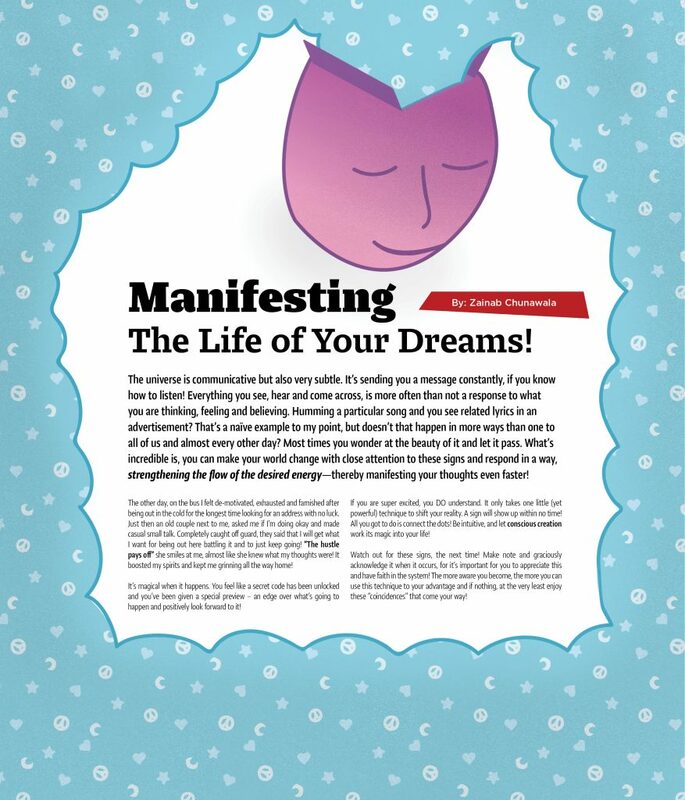 What’s incredible is, you can make your world change with close attention to these signs and respond in a way, strengthening the flow of the desired energy—thereby manifesting your thoughts even faster! The other day, on the bus I felt de-motivated, exhausted and famished after being out in the cold for the longest time looking for an address with no luck. Just then an old couple next to me, asked me if I’m doing okay and made casual small talk. Completely caught off guard, they said that I will get what I want for being out here battling it and to just keep going! “The hustle pays off” she smiles at me, almost like she knew what my thoughts were! It boosted my spirits and kept me grinning all the way home! It’s magical when it happens. You feel like a secret code has been unlocked and you’ve been given a special preview – an edge over what’s going to happen and positively look forward to it! If you are super excited, you DO understand. It only takes one little (yet powerful) technique to shift your reality. A sign will show up within no time! All you got to do is connect the dots! Be intuitive, and let conscious creation work its magic into your life! Watch out for these signs, the next time! Make note and graciously acknowledge it when it occurs, for it’s important for you to appreciate this and have faith in the system! The more aware you become, the more you can use this technique to your advantage and if nothing, at the very least enjoy these “coincidences” that come your way!